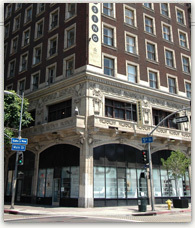 Served by several major freeway routes, Downtown Los Angeles is rapidly becoming a cultural hub. The multiple districts not only offer an exclusive glimpse into the history that helped shape the central city’s character, they also offer unique shopping and entertainment opportunities. Chinatown offers a fascinating bustle of family-owned shops, dim sum houses and ethnic eateries,the Fashion District is a Mecca for retail bargain hunters, and the Jewelry District boasts home to the second largest assemblage of jewelers in the world. With the financial district just a short walk away, a resident of The Rosslyn Lofts is able to live, work and socialize all in close proximity to home. In the past few years, dozens of new art galleries have been emerging in downtown Los Angeles. The Rosslyn Lofts are located in close proximity to the Art District and the Museum of Contemporary Art. With the monthly Art Walk passing right past The Rosslyn Lofts, they are conveniently placed for anyone with a passion for art.